Ok, so you might not have a PHD, it might not be relevant to your area of employment, maybe other people don't even realise that you have supreme skills, but there is something that you're so passionate about that you practice it all the time. Maybe your friends come to you for advice on this subject. They might say, that you are an expert. Whether it's parenting, blogging, baking, gardening, cooking, photography or crafts, you possess knowledge that someone out there needs. So what do they do? They turn to the internet. 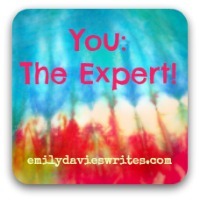 And this is where blogging comes alive - because you get to share your knowledge, expertise and skills with the world. Posts can be brand new or from your archives. The linky will open at 7am on Wednesday mornings and close at 5pm Friday evenings - meaning that if we want to spend our weekend giving something a go, we've got time to plan! Please link back to the linky somewhere on your blog - within the post if it's new but if it's an archive post then a sidebar mention is fine (there will eventually be a badge available*). And of course, share the love and comment on at least two other people's posts and if you discover a genius idea, be sure to tweet about it. I'll also be starting a Pinterest board so we can all share tutorials in the same place if you so wish. *Creating blog badges is clearly not my area of expertise and I've been having html problems - so if anyone wants to link up a decent tutorial for this then feel free!! Alternatively, I'd be grateful if you could email me and offer your assistance! I'm so looking forward to learning new things and will share if I try anything out. I hope you'll join me!